As our application starts I want to fire the request for data, so we call an init() method on initialization. Also I have turned the flex chrome off here with 'showFlexChrome="false"'. The init() method calls an event listener that controls the window movement (Drag and drop) and makes a call to getData(). The moveListener() method adds a listener to the outerCanvas element which forms the application 'border'. When this event is fired it calls moveWindow. The getData() function calls the webservice, and specifies which method to call. The moveWindow function also contains a check to see if the datagrid was the event target, as this was interfering with the functionality of the Datagrid. It would be interesting to see if anyone else has a more elegant solution to this, rather than a specific element check. To populate our datagrid we need to use a data provider. In FLEX applications I usually use the RemoteObject function, but for AIR I've been using the WebService tag. The final two 'chrome' functions we need are the minimize and close functions. I will detail handling custom chrome in another article. Our WebService is referencing two functions. A results handler and a fault handler. The resultsHandler() simply assigns the datagrids dataprovider as the result of the WebService call. By adding DataGridColumn's to the datagrid with the right naming convention our results from the returned query object will map directly to our datagrid. The faultHandler() function simply Alerts a user to a fault event. Lastly I have a function that assigns the image source dynamically based on the click event in the datagrid. So that completes the Phone Book AIR application. There are one or two tweaks I'd like to make in the image handling, but otherwise its exactly the spec I had in mind. You can view the full code here. I'm always asking what peoples phone numbers are in the office, we currently don't have any internal communications (like an intranet) so I thought I'd create a handy phone book application in AIR. With FLEX of AIR applications I often wireframe them up with the data model in mind first. If you know what data you are going to display, and the format and delivery mechanism of that data, it can often have a large impact on the design and layout of your application. In this instance I was just returning a simple query object of users and their phone numbers and a thumbnail image. My preferred server language is ColdFusion, so my service is a CFC object. Now that we know what the data will look like we can build the GUI front end. My display layer is going to be a canvas, with another canvas inside it, to create a bordered effect. Then I have a DataGrid, with a click event that will call an AS function. This will control the displaying of an image that corresponds to the user being clicked. Its always nice to see who you want to call! My 'userImage'has a showEffect attribute, that uses an image fadeIn method. It fades in the first image called, but not any others, I've had a play around with this, and I can't get it to fade in subsequent images, so if anyone has any ideas let me know! Lastly I have added some chrome controls, as I will be removing the standard chrome, and building my own. Now, on to the functions. I've recently been looking at putting together some AIR applications. I've used FLEX for a few years now, and have only just come up with some useful AIR ideas, so I thought I'd build an application or two. Usually I would use flash remoting, but I haven't spent too much time investigating how this works in AIR, so I've opted for the old school Web Service. In the middle of my newest AIR application I stumbled upon an issue. No matter what I did I was receiving a 'HTTP Error' response from my Web Service. After stumbling around in the dark for a while tweaking code to no avail, I decided to write the most basic Web Service I could think of. 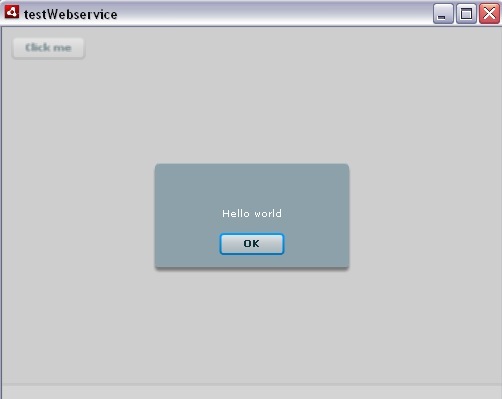 So here is 'Hello World', as a Web Service call from AIR. Firstly create a call to your Web Service. In this case it was a local file. Point the wsdl variable at the fully qualified path to your service. I am using a coldFusion back end, so it is a CFC. This is also where you specify the fault handler and result handlers. You can add as many 'operation' methods here as you want, that way you address specific functions in your service individually. I've also added a button that will call a function to action the service call. Next we will add the functions. A getter function, that will actually send the Service request, a fault handler that will simply Alert the user to a fault event, and a result handler that Alerts the user to whatever message is returned from the Web Service. The CFC service is a simply object to return a string. Just make sure that your 'Access' is set to remote. One thing I've learnt from my flex to CFC tomfoolery is that sometimes flex doesn't diplay very good error messages from CFC's. This is no fault of flex, but more usually a problem with the interface between it, and CF, as most of the unfriendly error messages you get are http error strings, which usually get truncated as they are raw code, so you don't get to see the problem then either. So its a normal component, with one function, it accepts an 'ID' and performs a query, and returns it. I am setting a local variable at the top, 'message' that will only be created and used inside the scope of the CFC. Then we will 'TRY' and do our transaction. At this point I'm wrapping everything in the cftry tag so as to encapsulate any possible code errors or logic faults. Any logic I have here will replace the value of 'message' if proven to be false, and return that message rather than the query object I was expecting. This will catch any errors from the try block, and throw them to flex. In this way flex receives the message in the throw command, not a http response message when the CFC breaks. This is obviously a Coldfusion - CFC specific example, but I've seen very similar error trapping in php, working in exactly the same way, so it really doesn't matter what back end your using with flex.